It is easy to be loved by your customers. Just give them something they really, deep down want (they might not even know they want it)! A week ago I went to a job interview and before the meeting I sat down at a café to gather my thoughts. I was both nervous and excited about the amazing job, so my heart was pounding. 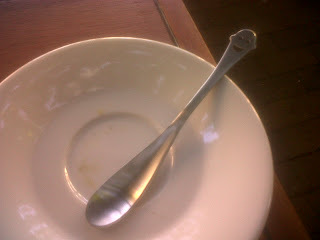 I ordered a coffee while waiting, and it was served on a plate with the spoon in the picture. Can you see the smiling face? Brilliant! People don´t buy Mulberry bags because they need a bag. We don´t buy fancy books because we are dying to read them. We don´t go binge shopping because we need more shoes or ear rings or gold clubs. Research has also shown that we give more tip if the waitress draws a smiley face on the bill, wo the smiling spoon is definitely a winner!